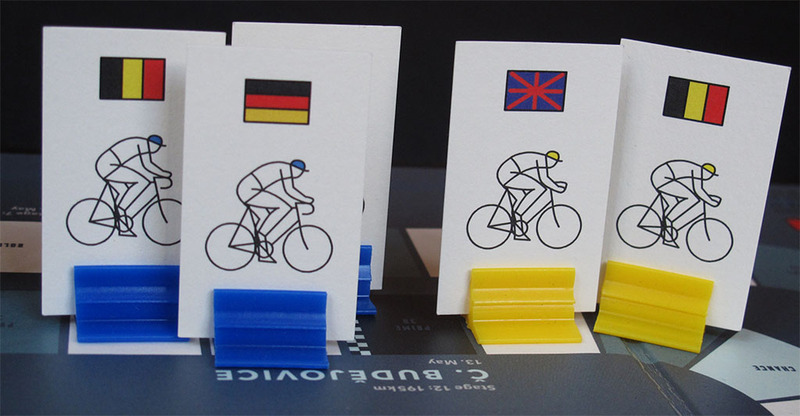 This is a modern game representing a discontinued race, the Peace Race (also known as Die Friedensfahrt, Závod Mirú, Wyścig Pokoju or La Course De La Paix). It is a limited edition collectable game only available as an add-on with Rapha's Peace Race jersey. 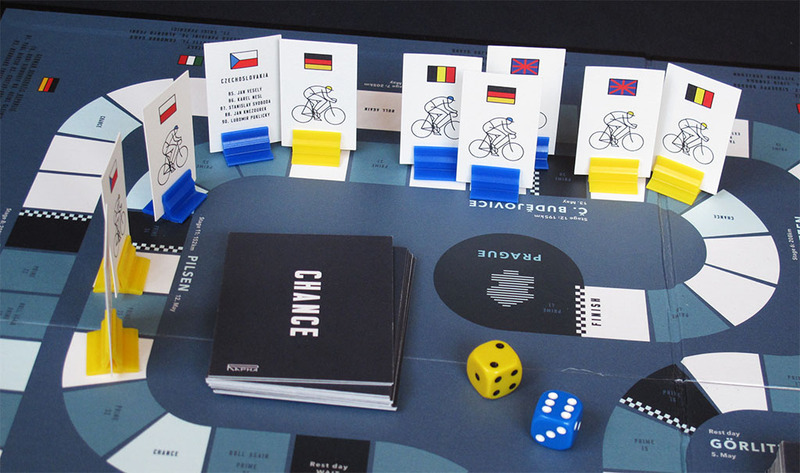 The game was conceived and developed by cycling historian Herbie Sykes, author of the highly recommended book "The Race Against the Stasi", subtitled "The Incredible Story of Dieter Wiedemann, The Iron Curtain and The Greatest Cycling Race on Earth", which is not so much a chronicle of the race or of former East Germany cycling, but a fascinating view on the different ways of living on both sides of the Iron Curtain. According to Andy Edwards, the game designer, “Most of the touch points of our game are from Soviet era board games. They were quite low cost, hence our box is just cardboard with staples on it. The playing figures are bits of paper which slot into plastic holders, which is quite authentic to how the players used to be back then too." The just-cardboard-with-staples-on-it box is actually quite big (32 x 22.5 x 9.5 cms) since it originally contained the game and the Peace Race jersey. By the way, the pack sold for £180. Not exactly "soviet era low cost". 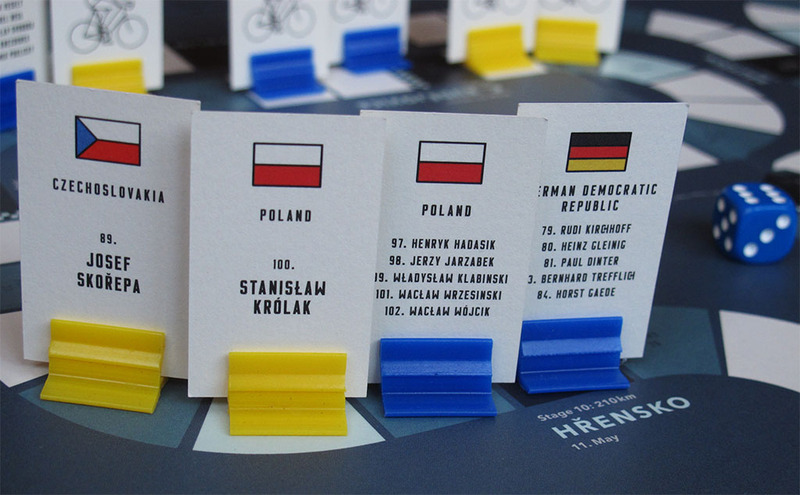 And of course the cyclists found in Eastern Europe games are much better than "bits of paper which slot into plastic holders". 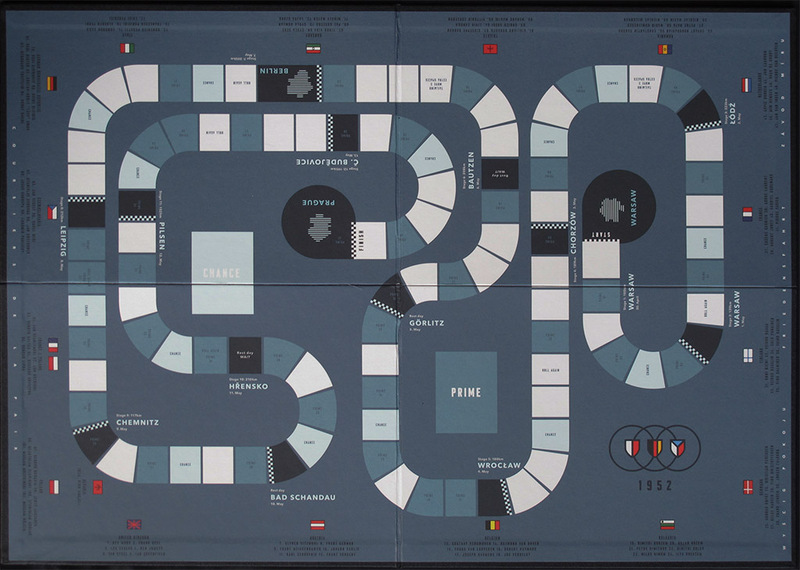 On the other hand, the abstract geometrical design of the board board (which measures 59 x 42 cms) reminds of socialist countries' games (compare, for instance, to Gemeinsam Vorn), though the colours, of course, do not. The name of the game is not obvious. 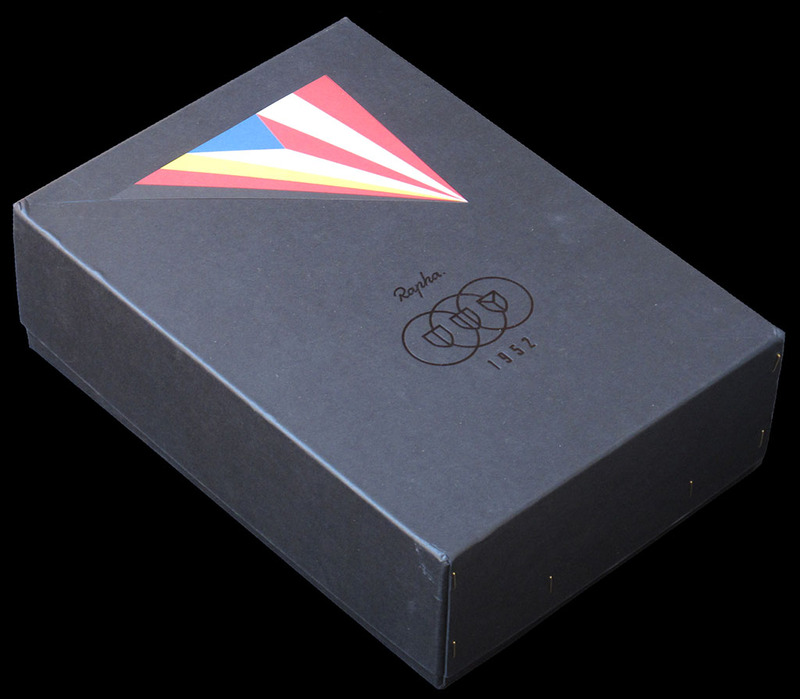 There is no name on the box (just "1952") and on Rapha's website the game is called "Peace Race" or "Race for Peace" but the rulebook is titled "Warsaw - Berlin - Prague 1952". That is the title I have chosen to feature the game on this website, but I admit it is debatable. As you can see in the picture above, in the box we also find a smaller cardboard box probably supposed to store the cards (they do not fit, actually) and a cloth bag with the Picasso peace dove and the Rapha logo where you can keep the riders, the dice and the remaining cards. In fact there are two classifications, the individual race for the yellow jersey, and the team race for the blue jersey. The winners of the blue jersey are the team which has accumulated the most "Primes", which include stage wins (equivalent to three primes). The less important yellow jersey is won by the first leader (rider with a yellow cap) to reach Prague. What is weird is that there are two "rest days" where all riders are regrouped. So, finally, the winner of the yellow jersey is the winner of a short race (23 squarees) from Hřensko (end of stage 10 of the actual race) to Prague. There is not really much more to the game mechanics, except that if you throw a double you may move one of your riders double (that is, if you throw a double 5, one of your riders will move 5 and the other will move 10). Chosing which rider will move double is your only tactical choice in the game. Riders with the blue (team) and yellow (leader) caps and matching plastic bases. Complete list of the names on the backs of the cyclists. All the featured team leaders won the race at least once except Verschueren. 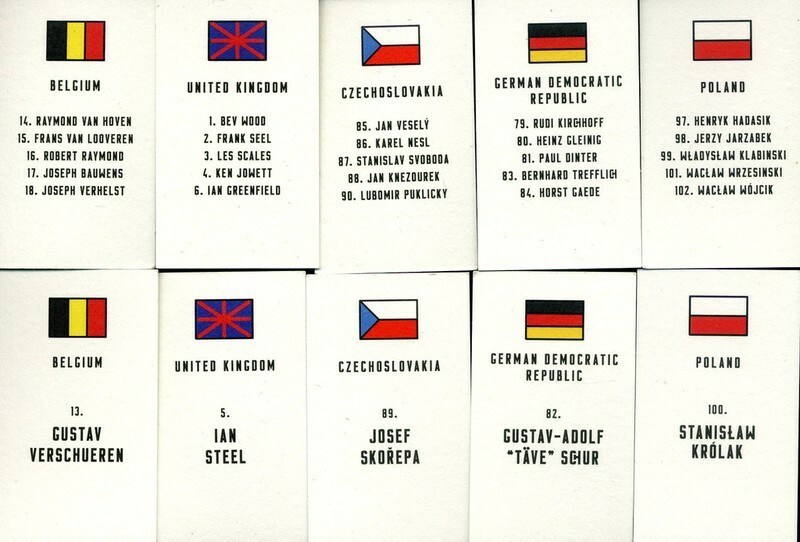 On the game board we can read the names of the 94 cyclists who took part in the 1952 Peace Race. All cards (41 Prime and 16 Chance cards) are different and they are by far the best of the game. 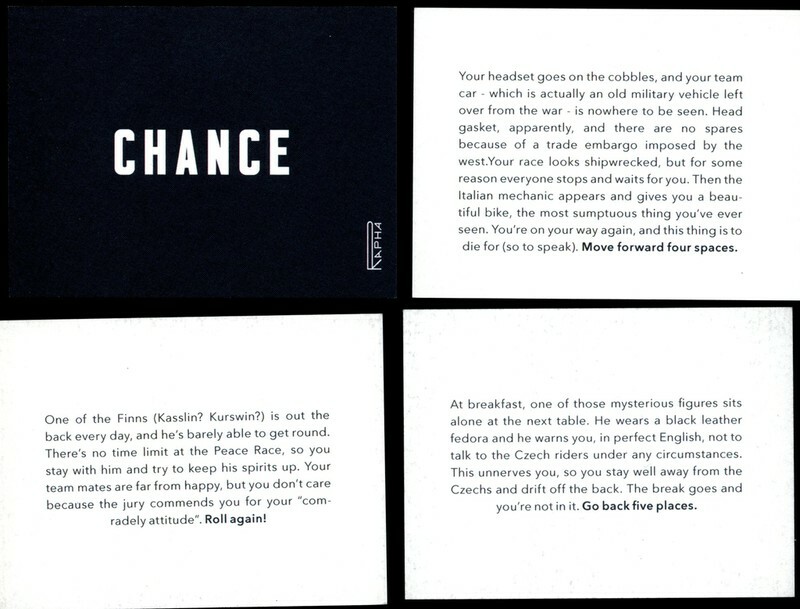 In fact, the game can be read as a (short) book, a humoristic view about what it was like to be on the Peace race. 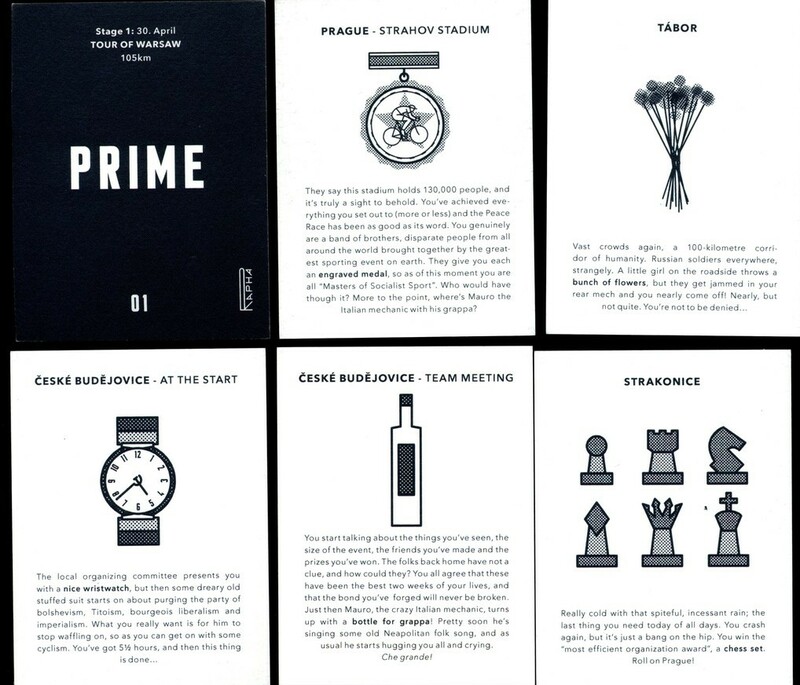 There is a small introduction to the race in the rules, and both the Prime and Chance cards would be the chapters of the book. 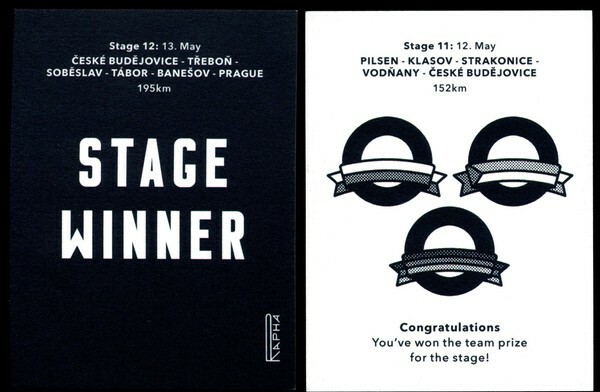 Stage winner cards. These do not have text. 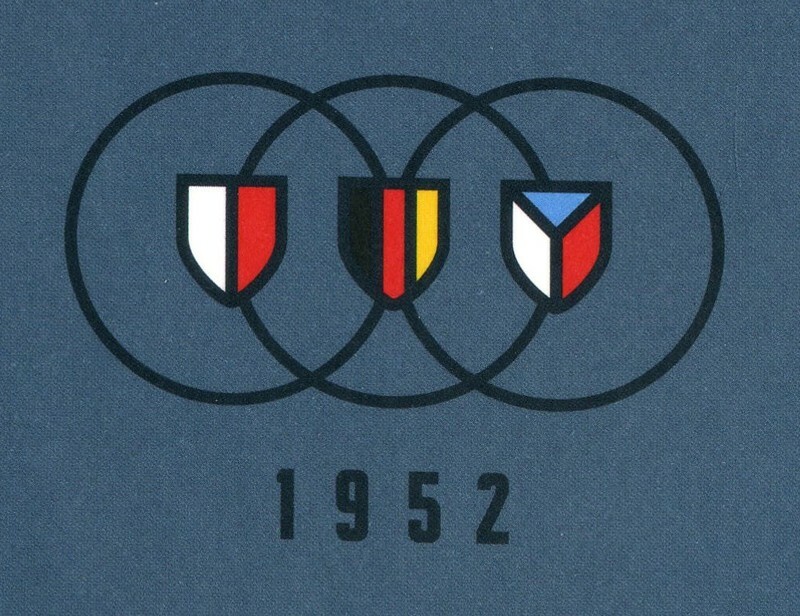 Was this the 1952 Peace Race symbol? Thanks to Thomas Engel for being the first to tell me about this game.